MP4 is the most popular file format that is used for playing in Xbox 360. However, despite of being the commonly used format there can be such times where it fails to work. Find out why? Altough MP4 is on the list of multimedia file formats that Xbox 360 can support, sometimes we still have trouble in transfering MP4 to Xbox 360 and play MP4 on Xbox 360. That's because the MP4 files supported by Xbox 360 have lots of limitations. 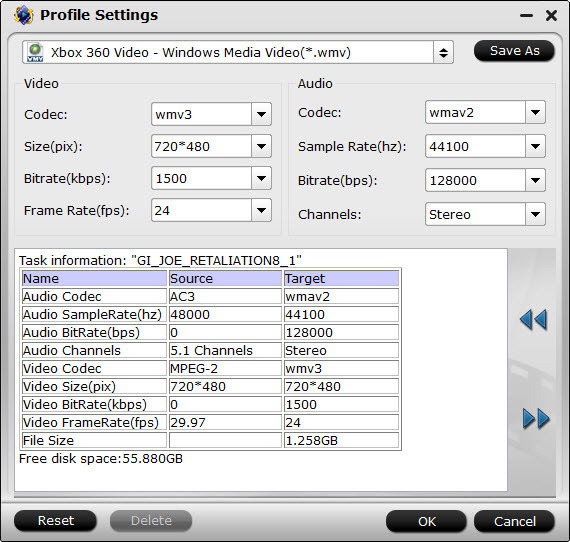 For video codec, Xbox 360 supports an MP4 file with the video codec of MPEG-4 AVC H.264 and MPEG-4. Besides, limitations extend to some detailed specifications like video bitrate etc. So, if your Xbox 360 can't access MP4 files, you're often told to re-encode your MP4 to Xbox 360 recognized formats. Considering there are so much specifications in MP4 files for Xbox 360, here, we strongly recommend iFastime Video Converter Ultimate to help you simplify your job. The software is a video transcoding tool, equipped with a codec pack that contains various codecs, including all kinds of MP4 no matter with H.264 or H.265 codec. The software is able to turn MP4, MKV, AVI, MTS, WMV, MOV, MPG… any popular video files to a decent format you need. Plus, it offers kinds of preset profiles for game consoles including Xbox 360, PS3, iPad, iPhone, Android devices like Nexus 7, Nexus 10, Nook HD, Samsung Galaxy Tab, Galaxy Note 4, etc to meet your different needs. 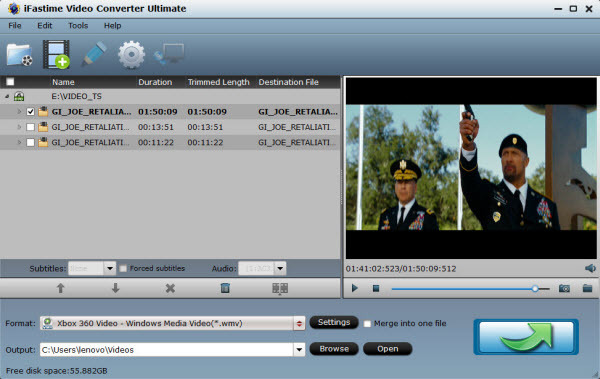 If you are Mac users, please turn to iFastime Video Converter Ultimate for Mac. 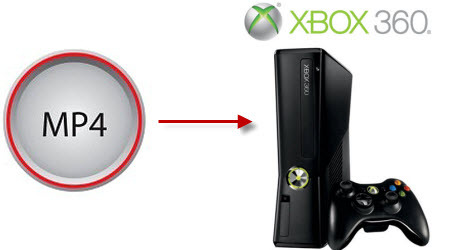 Now, just throw your MP4 files and re-encode to Xbox 360 with one simple click. 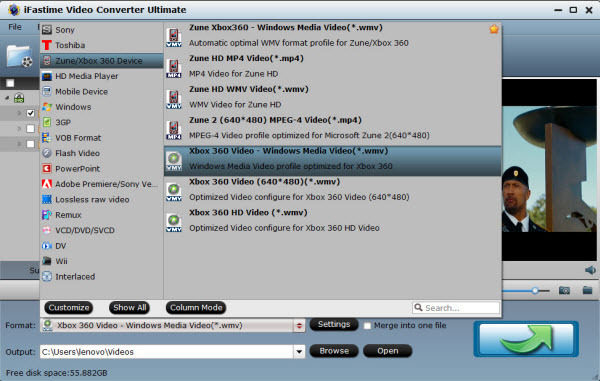 After run Xbox 360 Video Converter software, you can drag MP4 videos to the converter, or click the "Add video" button to browse to your media library and load the MP4 video files from there. If you have multiple source video MP4 files and want to merge them into one single output video file, make sure to tick the "Merge into one file" option. Many Xbox 360 users may not know the accepted video formats or audio formats by Xbox 360. This video converter is so easy to use, as it has video and audio profiles made ready for Xbox 360, so you do not need to find out what are the Xbox 360 support video files. To select output video file for Xbox 360, go to the Format section. Click to expand the video profiles list. Pick up the Xbox 360 compatible format "Xbox 360 Video - Windows Media Video(*.wmv)", "Xbox 360 Video (640*480)(*.wmv)", "Xbox 360 HD Video (*.wmv)" from "Zune/Xbox 360 Device". Along with Sony Xbox 360, you can also find the converter is also capable of turning videos to iPhone 6, Samsung smartphones and many other mobile phones or tablets. For professionals and advanced users, the powerful video converter has the capacity to allow users to customize the output video files, such as quality, video encoder, video frame rate, resolution, bit rate and so on. For Windows users: There are four ways to share the MP4 file to Xbox 360: Windows Media Player, Windows Media Center, Windows Home Server and Zune Software. Pluck just Windows Media Player 12 as an example. (Note: this method only applies to Windows Media Player 12 (Windows 7, 8, 8.1, 10) or 11 (Windows Vista). For Mac users: You have to use a third-party streaming solution to share the MP4 file to Xbox 360.